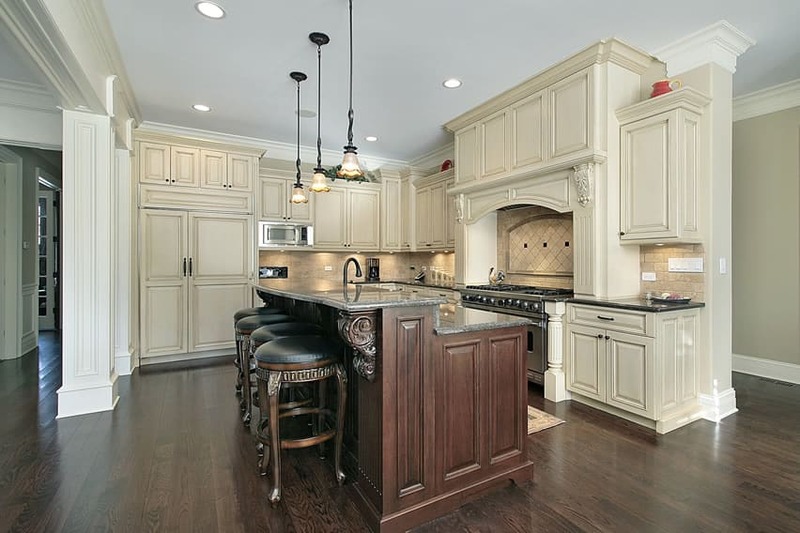 Classic kitchen designs tend to be timeless and evoke a luxurious appeal. 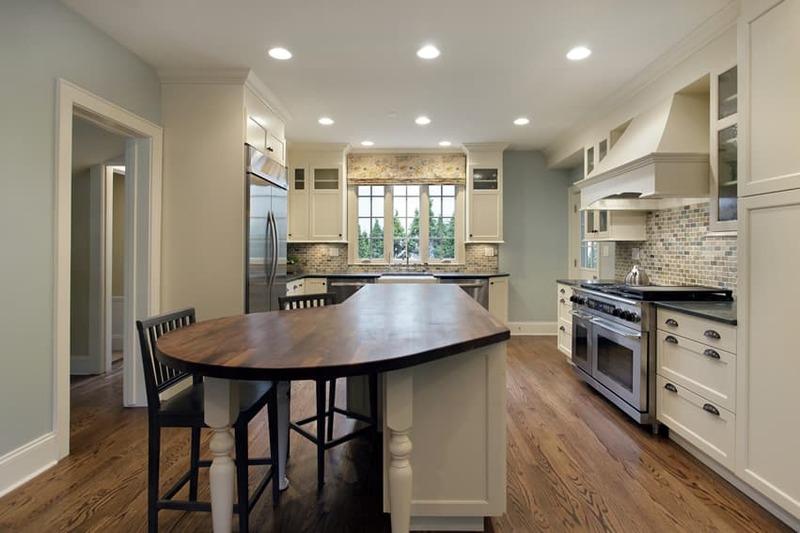 In the image above this kitchen design combines classic kitchen cabinets and a more updated color palette. The spacious kitchen is painted in a dark beige color with stone porcelain floor tiles, contributing to the classic elegance appeal of the space. Kitchen cabinets are of traditional design in white, combined with salt and pepper counter top. 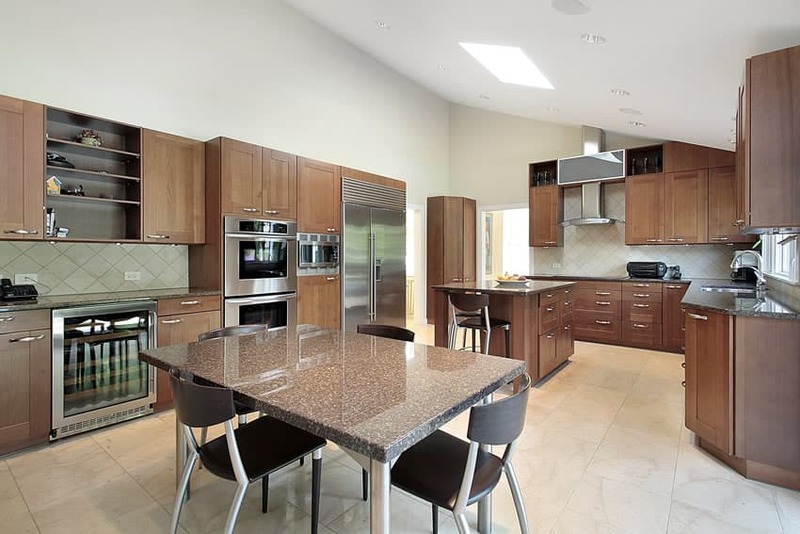 While the main kitchen cabinets are light and almost seems to fade into the background, the island counter in the center is stained in a dark walnut color and has a brown counter top which helps create a balance of light and dark colors. This open-plan kitchen is also uses Traditional styles and combines it with modern materials. 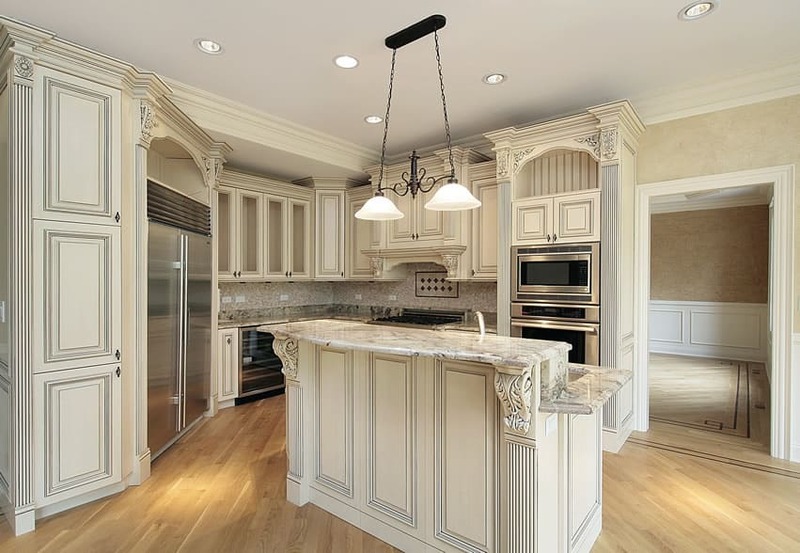 It takes inspiration from Greek and Roman architecture, evident in its use of white stucco walls for its backsplash and a Corinthian corbel with a curvy entablature which was used to conceal the range hood. Additionally, it uses Rosewood cabinets with simple moldings, creating a more modern appeal. For the counter top, it uses a cream solid surface material, creating a clean and seamless surface. 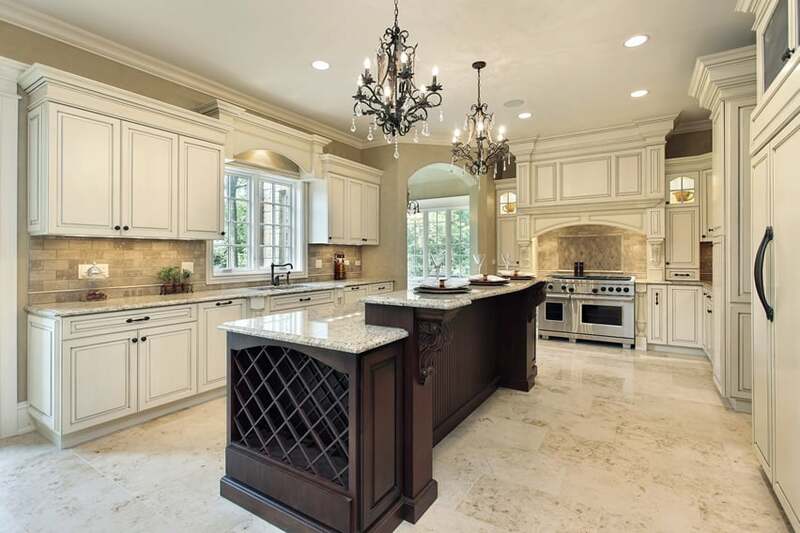 Lastly, the wrought iron chandelier hanging above the island counter adds to the classic elegance of the kitchen. 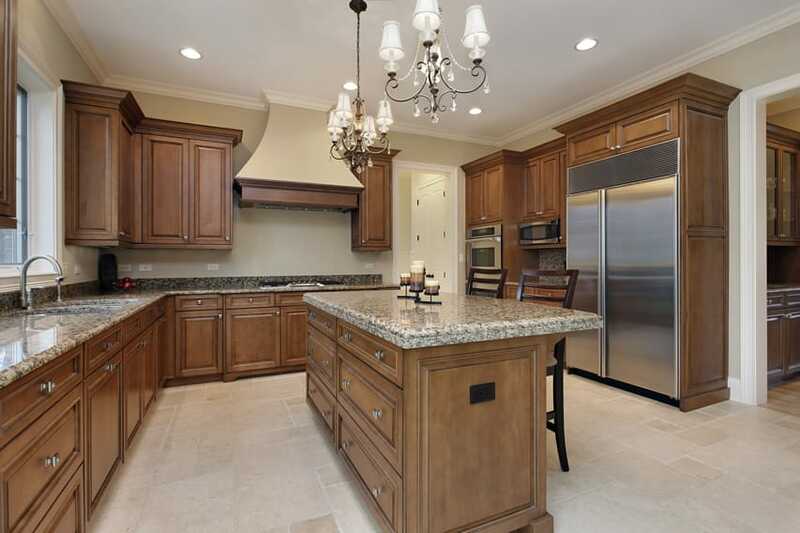 A traditional style kitchen with gorgeous dark walnut cabinets and gray granite counter tops. It utilizes space effectively by using a layout which follows the natural traffic flow of the kitchen. It separates the storage space & the oven wall with the preparation area, the range and the food counter, to enable efficient movement in the kitchen. A light beige color was used for its walls instead of white, to retain that bright spacious look, without the worry having visible wall stains typical of pure white paint. This kitchen give a modern take on that classic country-style kitchen, with its use of traditional kitchen cabinets with detailed moldings, and painting it with a pale yellow, giving it a more updated look, but still retaining its classic, country appeal. It uses light gray glass mosaic tiles for its backsplash and gorgeous slabs of white carrara marble for its counter tops for that elegant and luxurious look. Wrought iron chandeliers with warm white lights hangs above the island counter giving the space a warm homey glow. This kitchen takes inspiration from traditional kitchens and gives them a more modern take. Instead of detailed moldings on doors, it uses a simpler cabinet door design combined with glass and clean white paint to give it a modern upgrade. Floors are of natural Golden Oak planks and walls are of a sky blue color. For the counters, black granite was used and paired with multi-color brick tiles for its backsplash. In the middle of the kitchen is a food counter with gorgeous solid wood top which can also function as food preparation area. 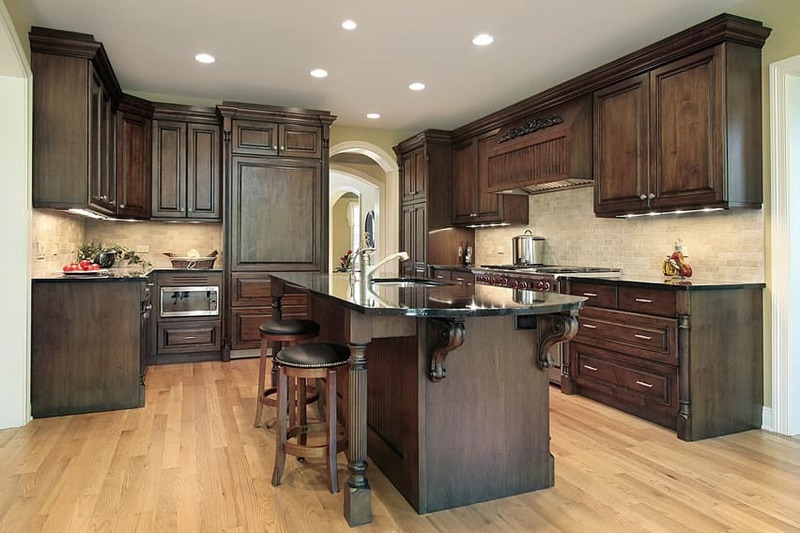 A traditional kitchen with lovely dark walnut-stained cabinet doors with neo-classic baluster detailing. It uses random-size cuts of natural stone tiles for its floors and a light mustard colored walls to brighten up the space. For the backsplash, white glass subway tiles were used for most of the kitchen, but simple 20×20 white ceramic tiles was used for the range backsplash. 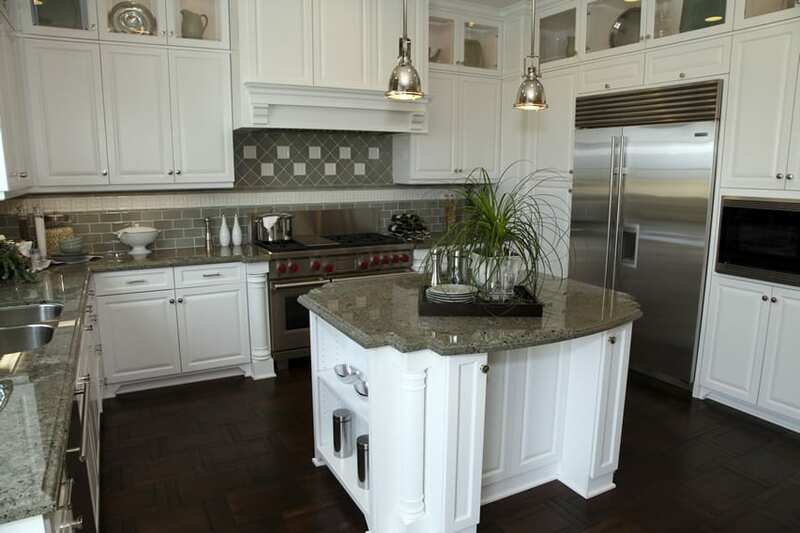 The countertops are gorgeous light beige granite, but the center island uses white marble instead. 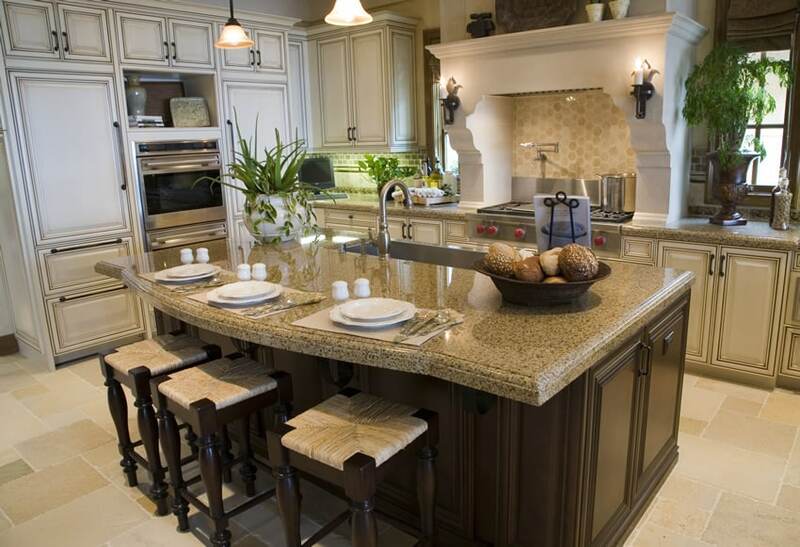 The polished Giallo St. Cecilia countertop of the island counter wound be the highlight of this gorgeous kitchen. It uses white cabinetry with simple detailing, faux balusters and french door cabinets, and also conceals the refrigerator as part of the kitchen cabinets, making a cleaner look. The backsplash material is of beautiful rectangular stone tiles in a running bond pattern, with a unique accent tile above the range with floral and metallic patterns. This kitchen opens up to living area, making it a great showcase kitchen perfect for entertainment. 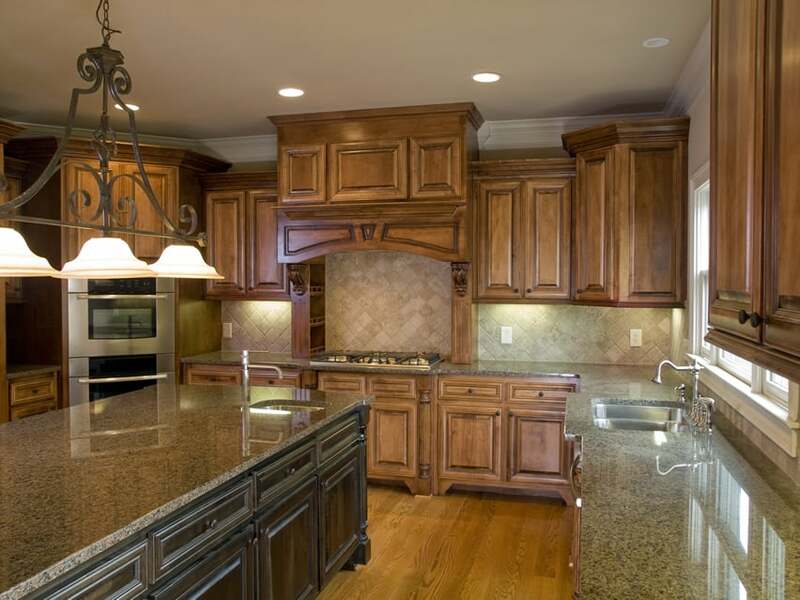 This kitchen uses picked Oak and Golden Oak molded cabinets, making the whole kitchen look very warm. To counter the warmth of the cabinets, light green paint was used on the walls and a more neutral, Baltic Brown countertop was used. For a more modern look, the kitchen cabinets are devoid of pulls and knobs, while the appliances are all in stainless steel finish. A two line modern kitchen which directly connects to the small dining area and small office desk. It has white cabinetry with aluminum-framed glass overhead cabinets and gray stone mosaic tiles for its backsplash. It uses gray solid surface quartz countertop with white specks for that modern seamless look. The island counter uses a lighter gray solid surface material, and functions as a breakfast table and as additional preparation area for the kitchen. A gorgeous white kitchen with skylights and a large floor-to-ceiling French windows, helping illuminate the space and give it more drama. It uses simple white cabinets iwth mouldings and baluster accent details which is combined with warm gray paint and white subway tile backsplash. The main counters uses Blue Pearl granite for its countertop material, while the island counter combines it with solid Mahogany wood. 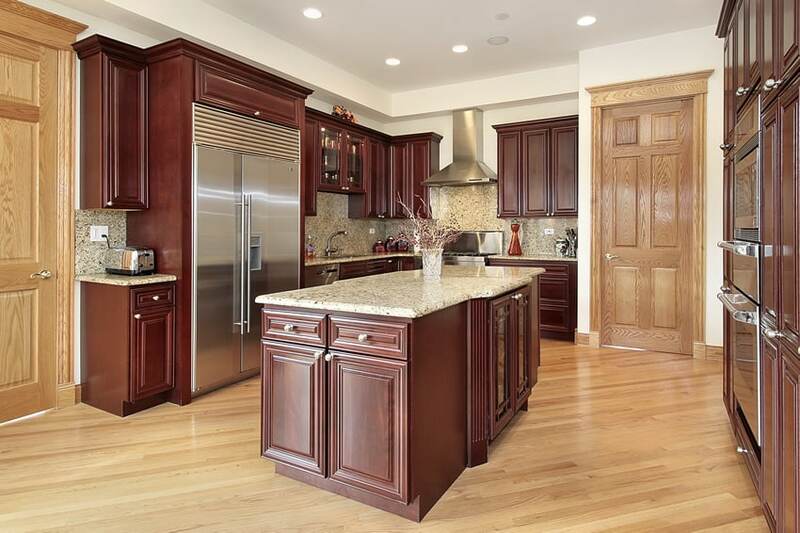 This kitchen uses traditional-style cabinet doors in a dark wengue finish which matches the solid wood floors. The off-white paint color helps keep the space bright-looking despite the use of dark wood tones, while stainless steel built-in appliances helps give the space an updated and modern appeal. The large island counter with beige Granite countertop serves as the dish washing area, as well as a small breakfast table for three. The natural rattan of the dining chairs helps add texture and adds to the lighter colors of the space, along with the cream-colored tiles of the backsplash. This kitchen uniquely combines bleached white wooden cabinets with dark wengue moldings creating a nice contrast of colors. It also uses light yellow walls and 20×20 stone tiles in a light brown color for both the floors and the backsplash. You will notice that the modular kitchen cabinets are elevated from the floor with the use of black metal legs to minimize moisture contact and lengthening the lifespan of the cabinets. And lastly, it uses gorgeous Southampton quarts with round nosing for its countertops for both the main counters and the island counter. 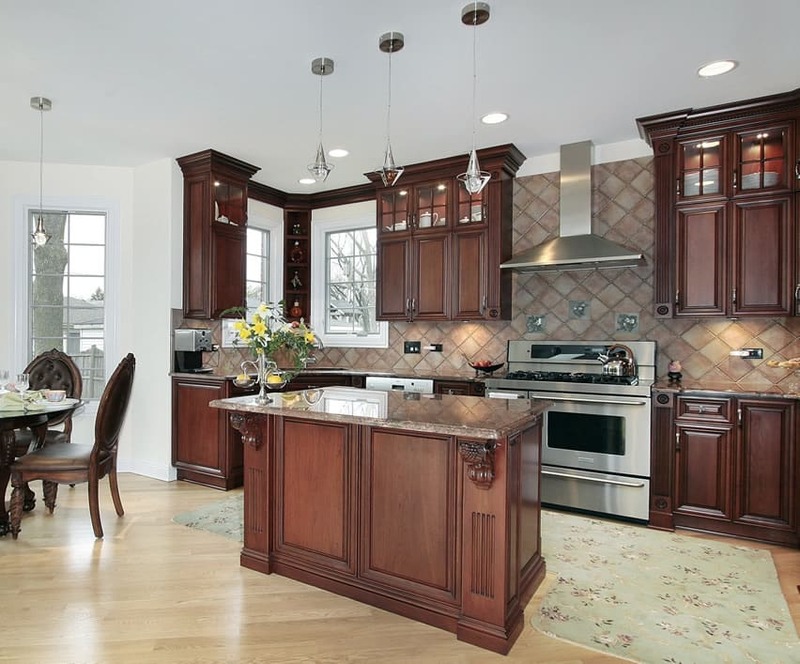 The stained walnut kitchen cabinets adds a classic charm to this kitchen. 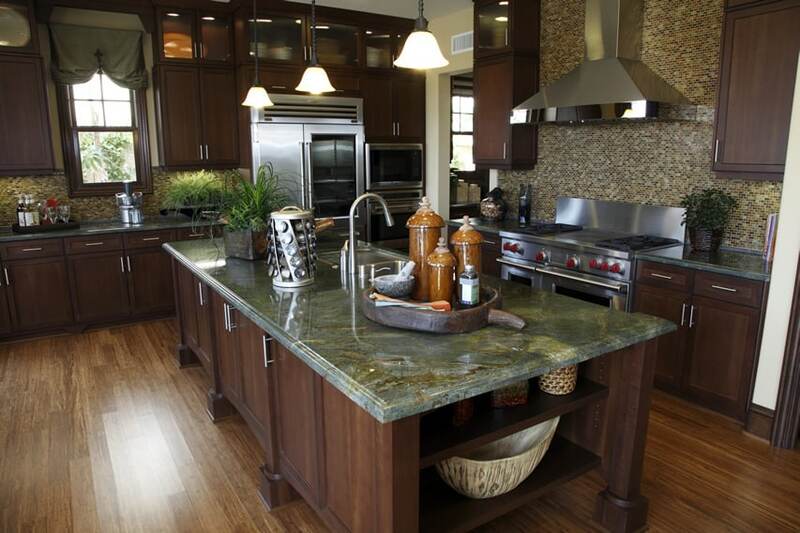 The island counter, however, is stained in a darker shade of walnut, making it stand out from the rest. All the countertops uses brown granite with a more modern straight nosing, combined with gray stone tiles for the backsplash. The stainless steel appliances and fixtures help keep a modern, updated look to this simple kitchen design. This kitchen possesses obvious neo-classic inspiration with its use of faux fluted square columns and Corinthian corbels. The walls of the kitchen itself is in a light yellow faux marble finish, matching the gorgeous white Carrara marble countertop of the island counter. The neo-classic inspired kitchen cabinets are in an off-white color paired with Luna Peal backsplash. High gable ceiling and open layout helps make the kitchen appear bigger than it actually is. Despite the fairly dark mocha and mustard wall paint, the space still appears bright thanks to its windows and sufficient artificial lights. Main kitchen counters have white cabinets, salt and pepper granite counters and running bond layout gray stone tiles for the backsplash to give it a rough and rustic texture. The island counter with turned balusters and vertical wood slats stands out from the space with its dark walnut finish and black granite countertop. This classic kitchen goes for a darker color scheme. With a beige base paint color to somehow brighten up the space, the kitchen itself combines 3 different shades of wood tones. The floors are Golden Oak engineered wood, while the main cabinets are stained in dark Mahogany. 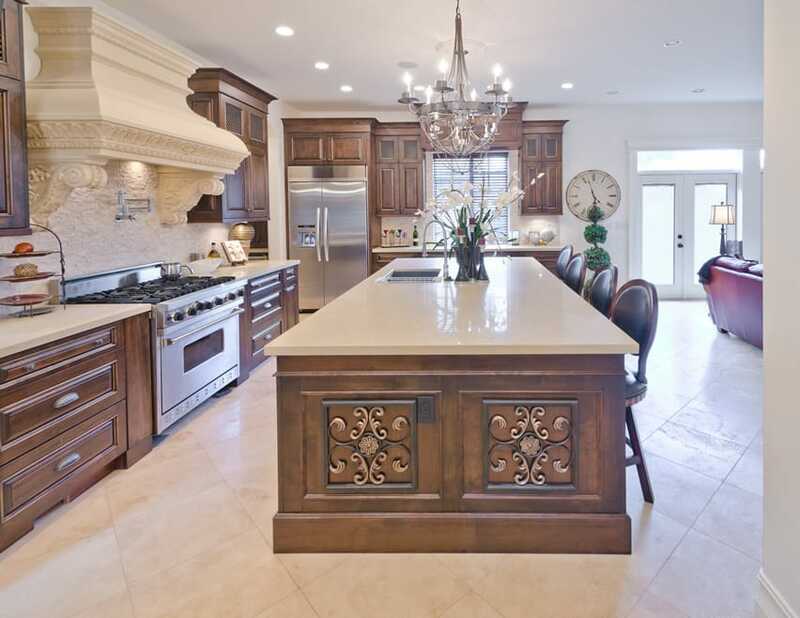 The island counter and the counter and overhead cabinet where the range cook top is attached to uses darker wangue-stained cabinets with neo-classic detailing. To lighten things up a bit, light cream Granite countertop was used and combined with light brown stone tiles for the backsplash. A sleek ultra-modern kitchen design which goes for the darker and more masculine appeal. It has dark cool gray walls, engineered golden oak floors and a large window which keeps the space well illuminated. 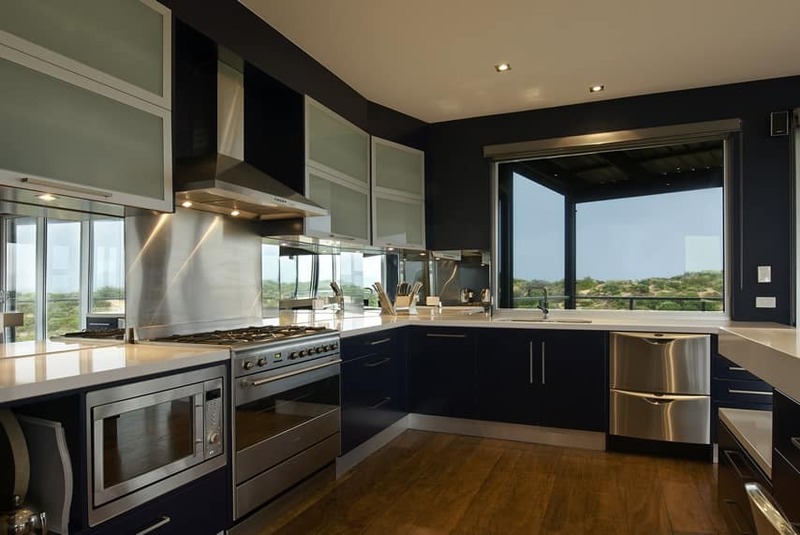 Modular kitchen cabinets are flat and plain with slate blue laminate finish and brushed stainless steel hardware. The plain white solid surface countertop, mirror backsplash, white graphicote range backsplash and stainless steel appliances adds to its modern appeal. This kitchen has dark stone floors, but the yellow wall paint and the warm mahogany cabinet color helps brighten up the space. The light orange brick backsplash matches the architectural brick finish of the columns and the arches, while the light red granite countertops give a lighter and warmer feel to the space. The black-painted island counter stands out from the rest of the kitchen as with its gorgeous wood countertop, making it the focal point of the space. Natural light has much contribution to the overall appeal of any space, and in this example, transom windows surrounding the kitchen helps illuminate the space without sacrificing the wall space for storage. Other the the natural light, the traditional style cabinet doors with a high gloss white finish helps reflect light, making it appear brighter, and also helps give it a more modern appeal. To match the white cabinets, appliances are also mainly in white, while the stainless steel refrigerator is concealed in white cabinets. 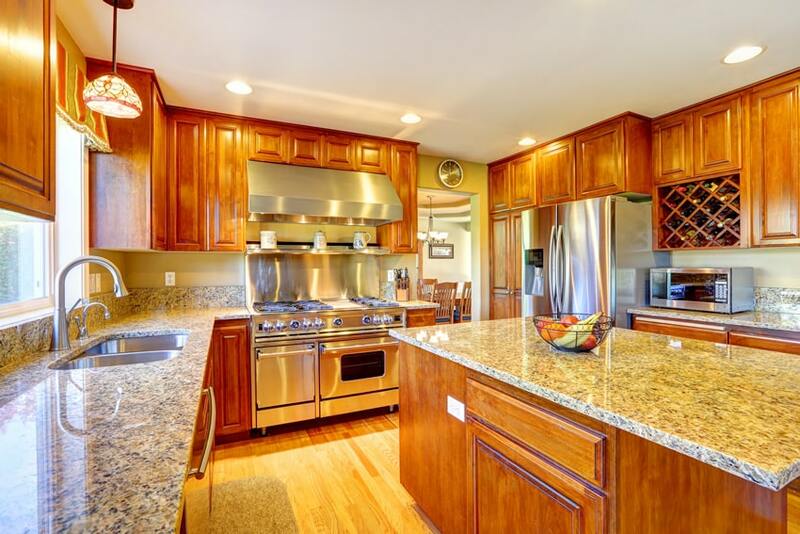 You can also notice that the corners of the kitchen are all rounded, from the intersection of the L-shape kitchen, to the island counter with red granite countertop. This kitchen goes for the simple black and white color scheme. 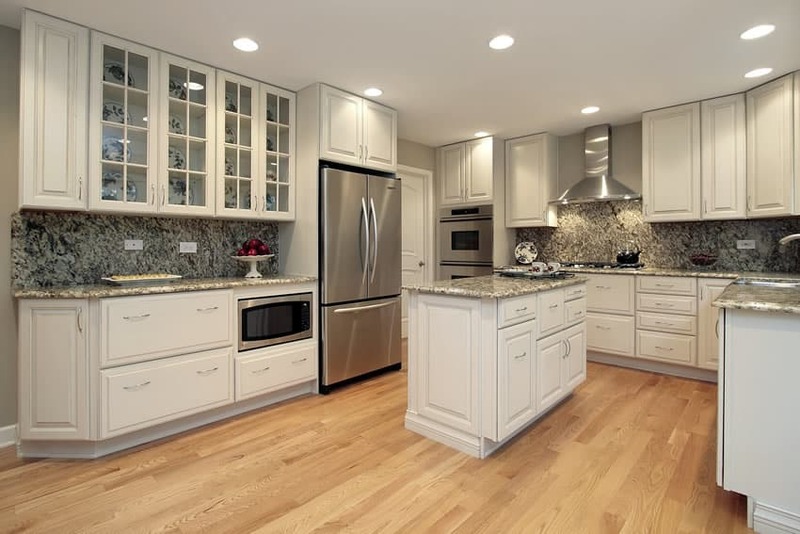 It has light yellows walls and ebony engineered wood floors which helps the all-white kitchen cabinets stand out. 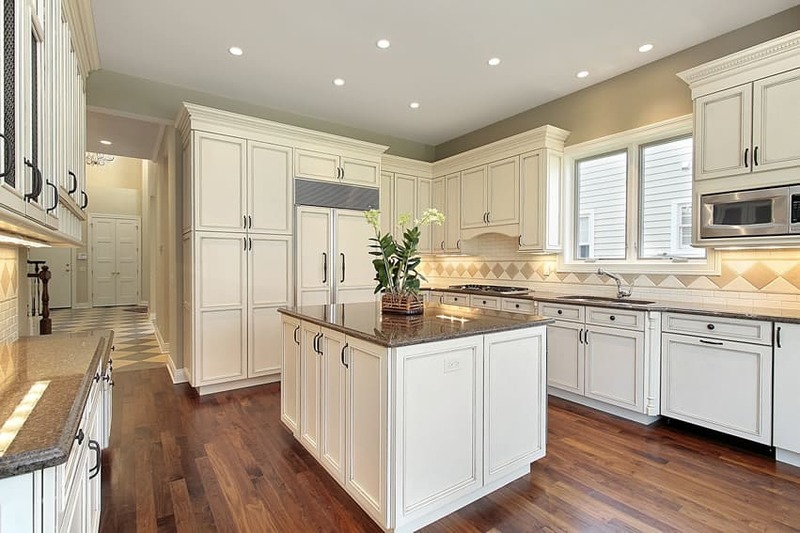 The white kitchen cabinets are devoid of unnecessary ornamentation and keeps it plain and simple, with only a crown molding as additional design. The countertops are black granite and paired with gray and white mosaic tiles for the backsplash. The bertoia bar stools with black seat pads also matches the theme of the kitchen, while the glass pendant light give the space more charm. This is a kitchen with traditional-style cabinets which uniquely combines different stain/paint colors for its cabinetry. 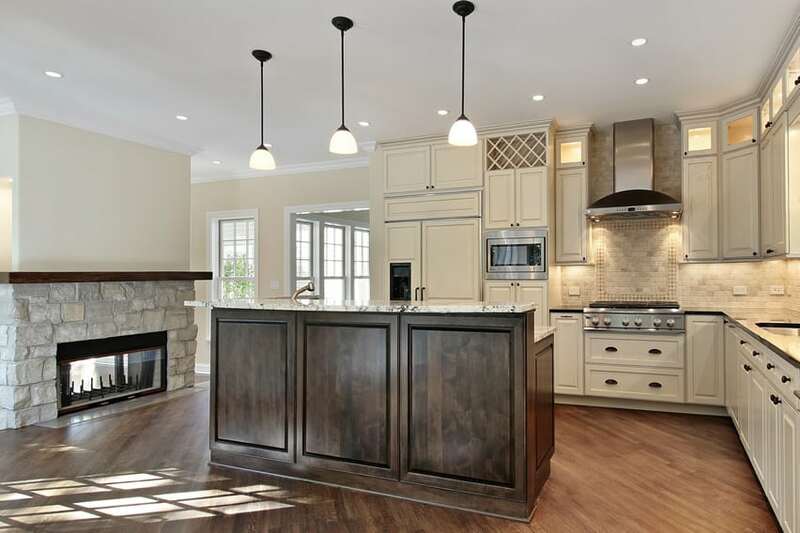 The island counter and its wooden bar stools uses a darker wengue wood stain color, the main kitchen counters are of a lighter light cream color while the cabinets with the oven wall on the other hand, uses a more grayish white tone. 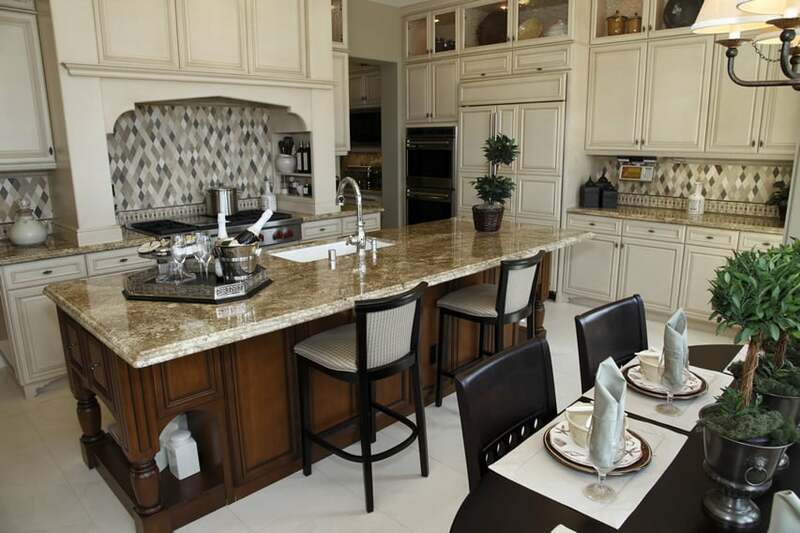 Countertops uses a thick slab Gallo Veneziano granite with molded nosing to match the classic appeal of the cabinets. 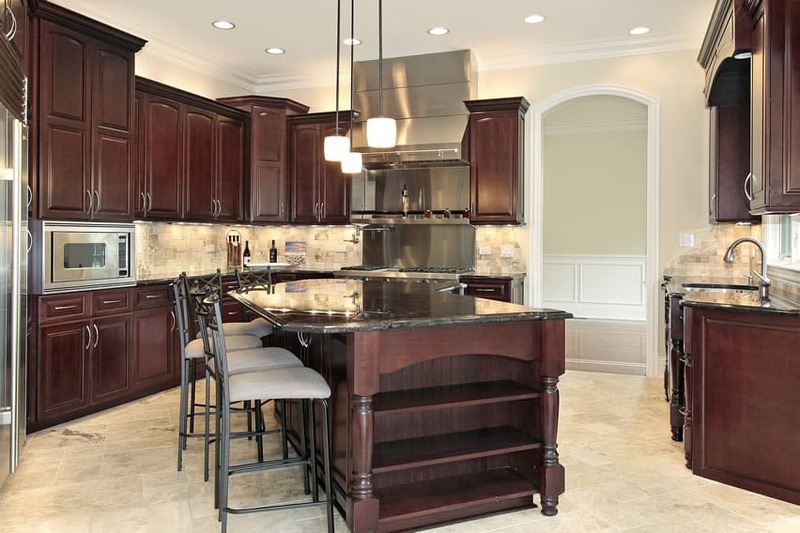 This kitchen combines dark finishes with lighter finish to achieve an appealing contrast of colors. Dark elements consist of the wengue main cabinets and the dark mahogany wood floors, while the white subway tiles and white marble countertop with round nosing helps lighten the main counters. The white-painted wood of the island counter with blueish gray countertop stands out from the dark wooden floors. 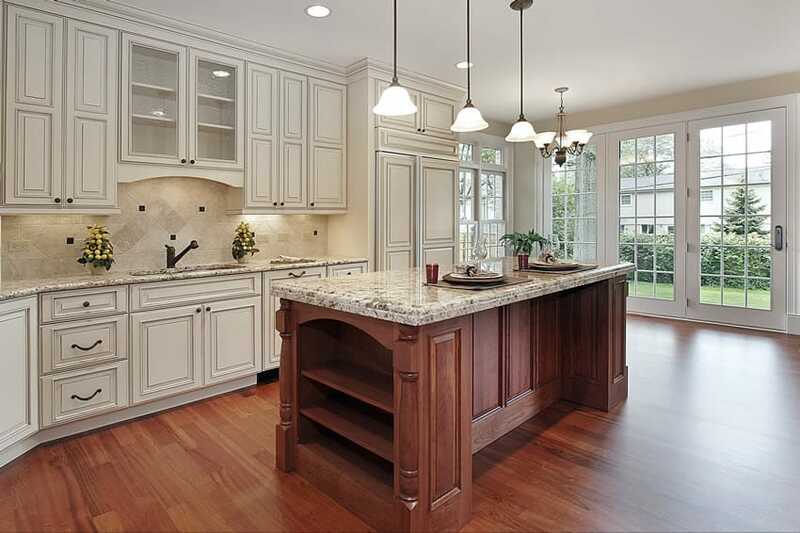 Luxury kitchen ideas that have dark wood cabinets can balance it out with a light color flooring or backsplash. While this kitchen uses dark walnut-stained cabinets with neo-classic ispiration and black granite countertop, it’s light oak wood floors and light yellow walls helps brighten up the space and makes it appear less dark. The light beige stone backsplash also contributes in making the kitchen brighter and the lights on under the overhead cabinets makes food preparation easier. 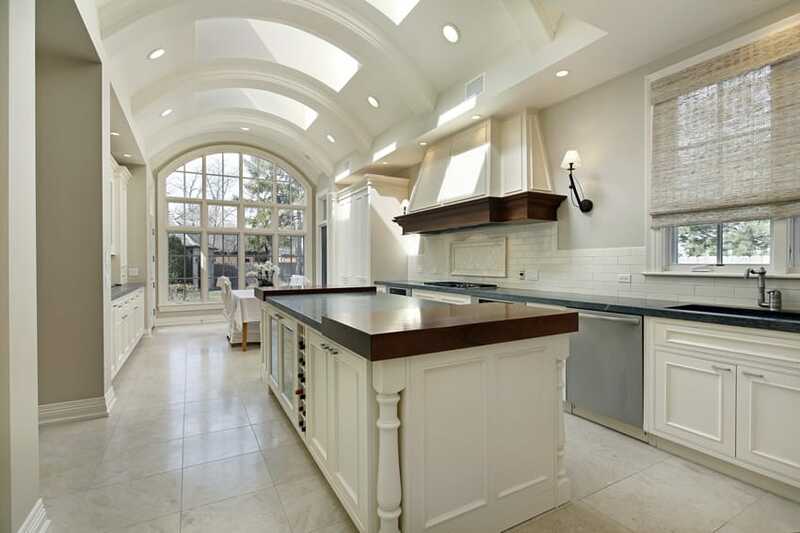 This large kitchen appears even larger thanks to its high gable ceiling. Sufficient natural light and white faux marble floors also help make the space larger and brighter. The kitchen cabinets goes for the more modern Walnut laminate finish, making a more uniform and clean look for the kitchen. The countertops are of dark gray granite with round nosing and paired with plain white ceramic tiles for the backsplash. 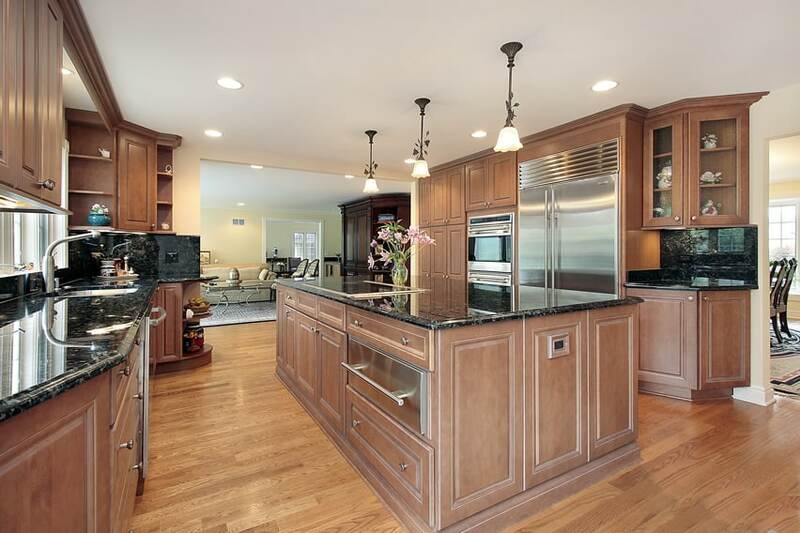 This kitchen maximizes the use of the wall space by occupying the whole wall height with cabinets. Cabinets too high are not very functional as they are hard to reach, but this kitchen design solves that problem by utilizing the upper non-ergonomical cabinet space as a nice display area for china wares and other items. The rest which are ergonomically accessible are retained as kitchen cabinet storage. Also notable is how the white classic style cabinets stands out from the dark parquet floors, and how the gray countertops matches well with the gray glass subway tiles for the backsplash. This kitchen also makes full use of the wall space. However, unlike the example above, this kitchen opts to utilize the full overhead cabinet as storage space rather than divide it for display and storage, but the verticality of its molded details helps make the walls appear longer visually. 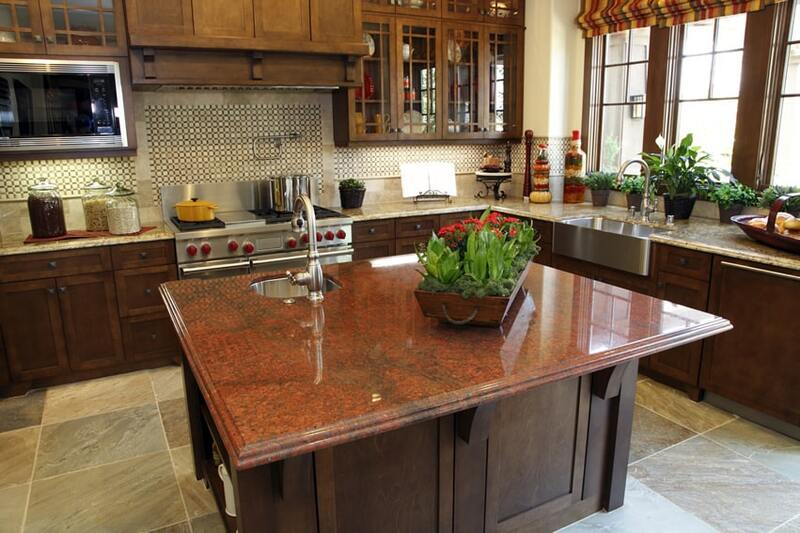 To contrast with the light walls and cabinets, a darker countertop in Dakota Mahogany granite was used. A traditional-style kitchen which adapts a modern layout and combines its traditional wooden cabinets with more modern finishes. The molded cabinet doors are of an off-white finish which is different from the Golden Oak finish of the island counter. To unify them, both uses Santa Cecilia granite countertops. For the backsplash, it uses interesting mosaic tiles with a modern geometric pattern in slate blue and light cream combinations. 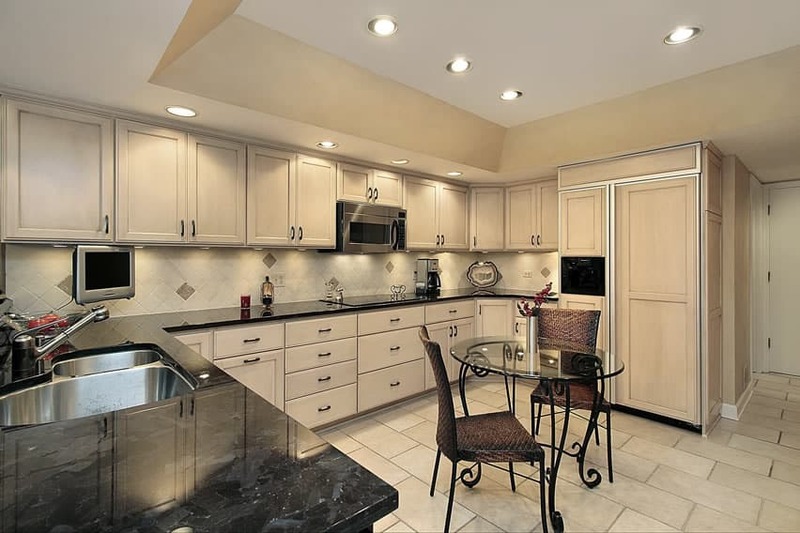 This is a full kitchen with traditional style cabinets in white finish with dark gray Granite countertop. It uses gorgeous engineered wood floors, and conceals most of the appliances to be part of the modular cabinets, creating a clean and uniform look all throughout the kitchen. Beige tones for the wall paint set the warm earthy mood of the space and the diamond design of the backsplash tiles matches the hallway’s floor tiles. A fairly dark, engineered Mahogany floors is set against light yellow walls to create a balance of light and dark colors. This kitchen is fairly small, with one main kitchen wall and one large island counter. 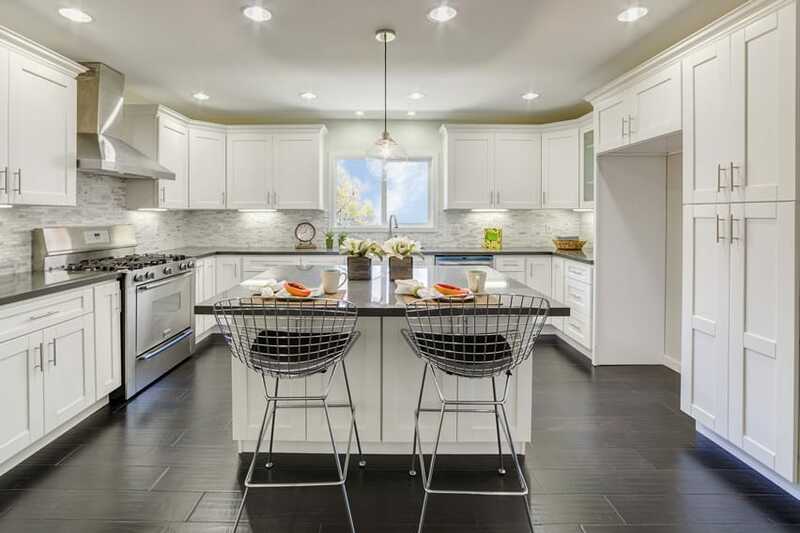 Classic white kitchen cabinets is set against the yellow background, while the island counter cabinets are stained in black, with matching black stools and topped with a gorgeous slab of granite. The space serves as a functional kitchen which is perfect for entertaining as the dining area is just by the bay window. Light beige stone floors and light yellow wall paint set-up a bright atmosphere in this full kitchen. 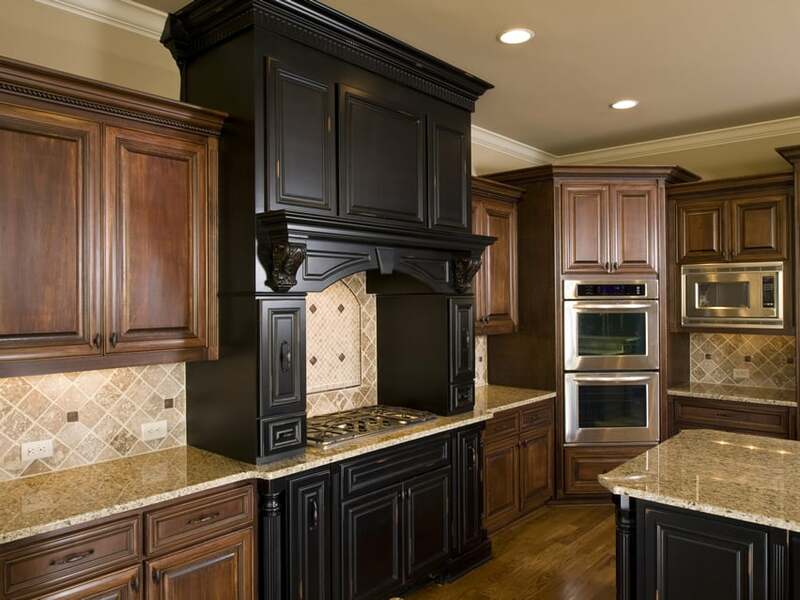 Kitchen cabinets adapts traditional cabinet design with red mahogany stain finish and topped with a gorgeous slab of black granite. The generous space makes room for a large and irregularly shape island counter which serves as extra preparation area and dining area as well. A full-sized kitchen which uses the full height of the kitchen wall for the overhead cabinet storage and display. The kitchen cabinets are of American Maple wood in a simple design, and the overhead cabinets is divided into the main storage which uses wooden doors and the upper display cabinet which uses wood-framed frosted glass doors. The Golden Walnut engineered wood floors serves as the lighter element of the space which matches well with the gorgeous mosaic backsplash tiles. 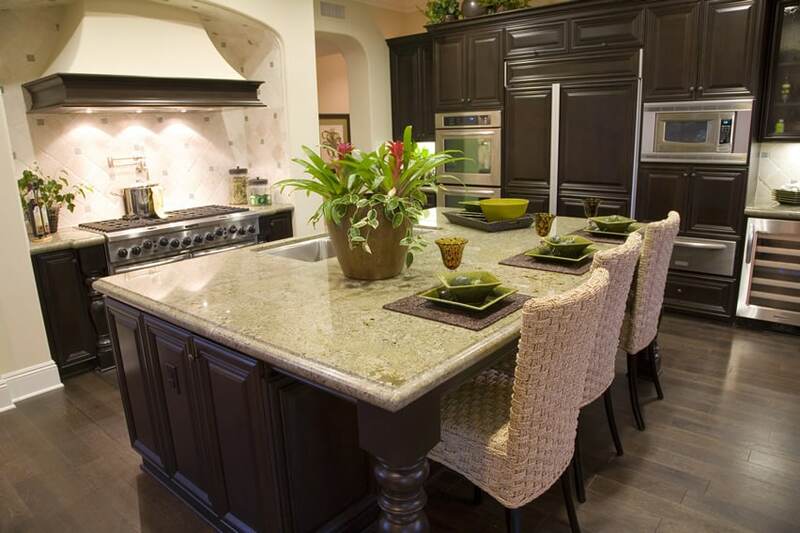 The countertop uses a unique green colored granite slab as opposed to typical black, gray and white granite colors. This large full kitchen serves as a great space for entertainment as it has open access to both the living and the dining area. It uses Golden Pecan engineered wood floors and paired with slightly bleached pine kitchen cabinets a traditional design. The gorgeous polished black granite countertops gives a good contrast of colors and is also easy to maintain. A kitchen with large wooden windows which helps illuminate the kitchen space, making it more conducive for food preparation. 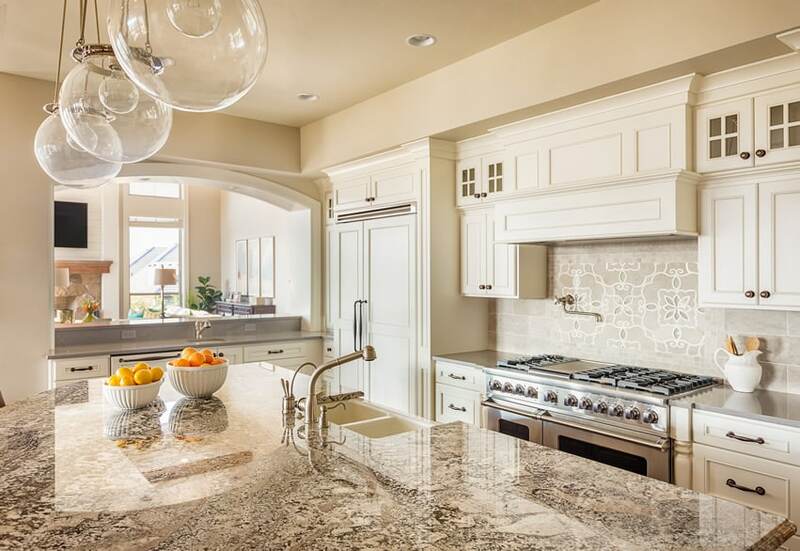 The kitchen cabinets uses solid Walnut wood in a simple panel design and topped with beige Granite countertop for the main cabinets and red Granite for the island counter. The overhead cabinets uses the same wood and finish, but combines it with clear glass, transforming the overhead storage into a display area as well. 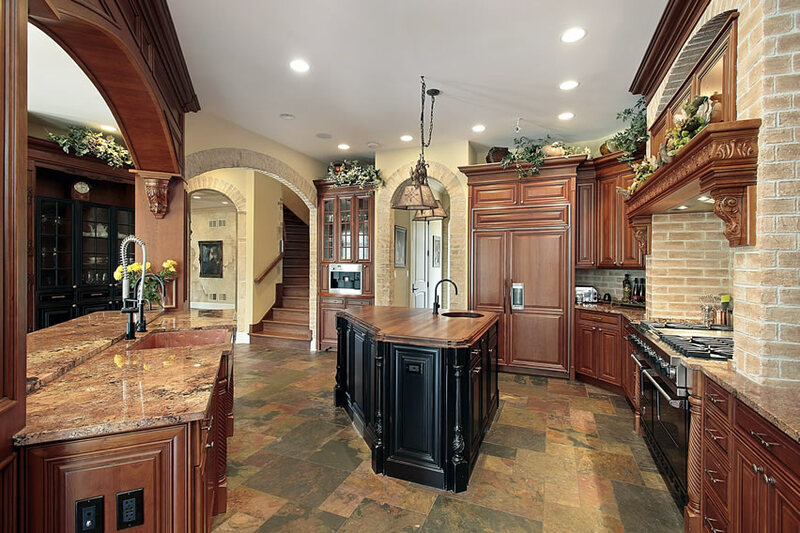 Floors for the kitchen are of natural stone tiles in different colors, giving the space more personality, and serving as a durable and easy-to-maintain floor surface. White walls and Beech wood floors serves as excellent neutral background for any space. 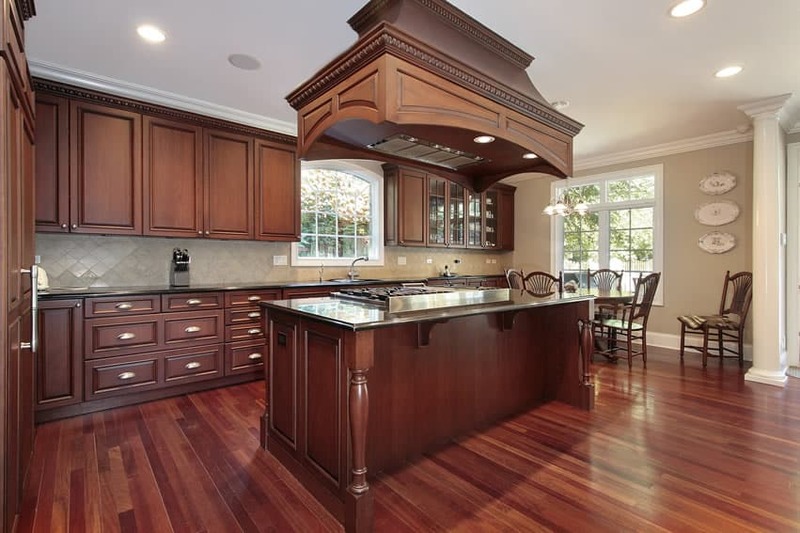 This allows this kitchen to use bold Cherry Wood cabinets without making the kitchen look too dark. Samoa granite was used for the countertops and paired with a similar color of mosaic backsplash tiles. Attractive stainless steel appliances such as a double oven, large refrigerator, and stove with hood help add to the upscale feel. 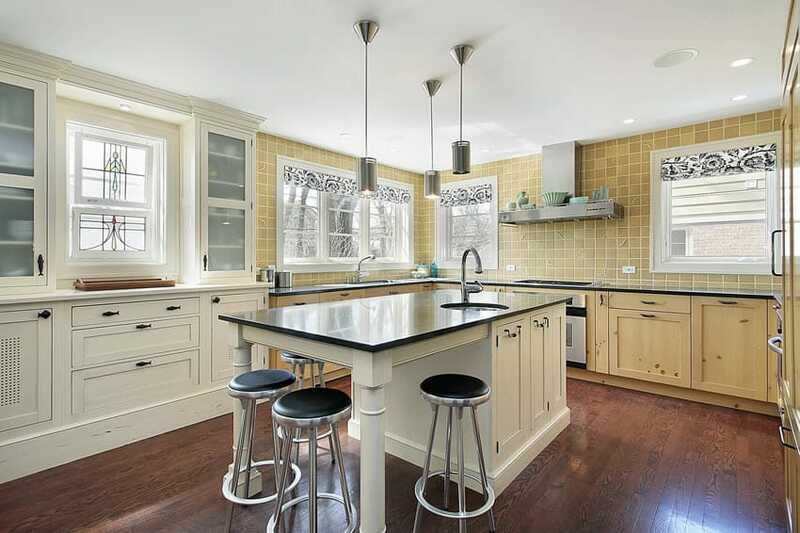 A quaint L-shaped kitchen with an island counter which opens up to the Garden / backyard. The large French doors and windows allows much natural light into the space and highlighting the beauty of the engineered Pine floors. The kitchen cabinets combines 2 finishes: white for the cabinets and natural Maple for the island counter. A thick slab of Delicatus granite was used for the countertops and this is paired with beige stone tiles for the backsplash. 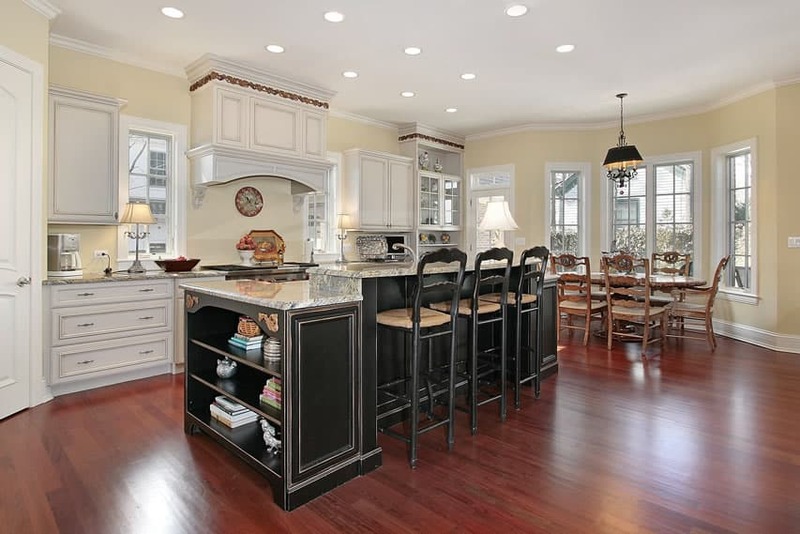 This kitchen uses a bold combination of Cherry Wood floors and Red Mahogany kitchen cabinets. It’s an L-shape kitchen with a large island counter and a small breakfast nook which has all the kitchen essentials needed. 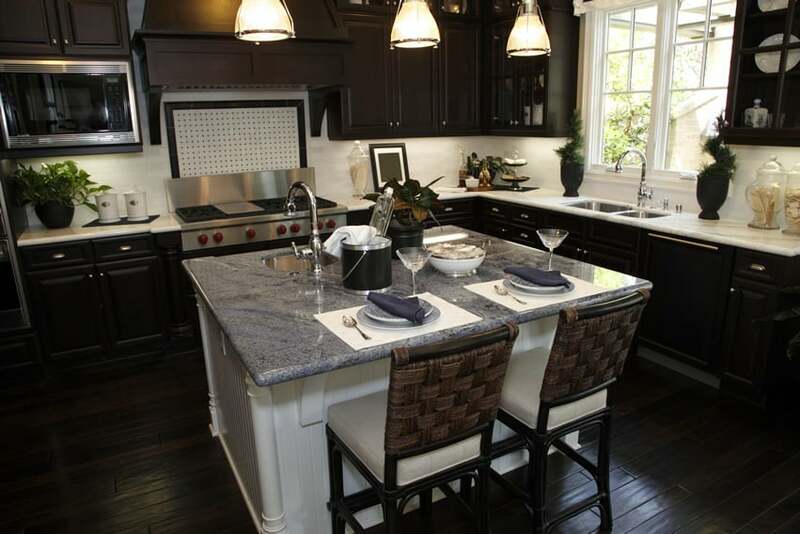 It uses black granite counters with white diagonal stone stiles for the backsplash. The island counter has large wooden hood used to conceal the range hood, retaining the functionality of modern appliances and at the same time, achieving the traditional kitchen look. Bleached Oak floors and gray wall paint serve as the neutral background for this kitchen. The white traditional style kitchen cabinets blends easily with the gray background and its gray granite countertop that seamlessly extends up to the full backsplash wall goes well with the gray wall paint. 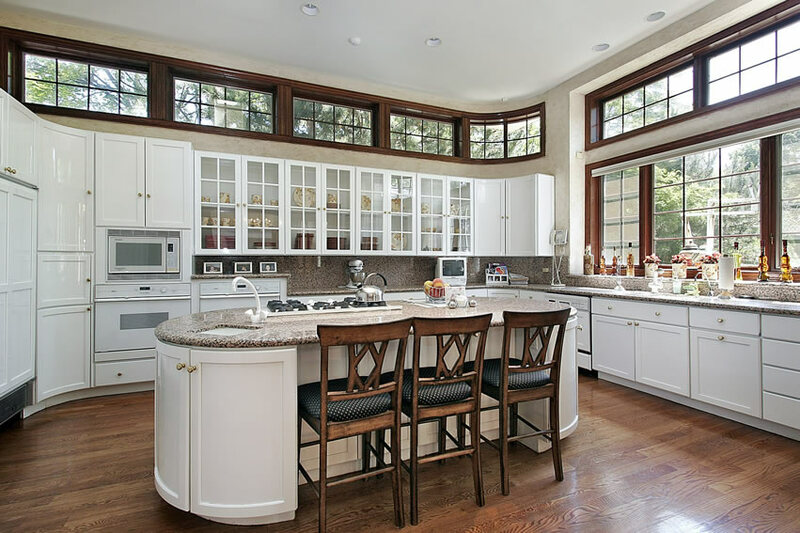 The kitchen has a small island counter for extra preparation area surface and has a section of its overhead cabinets use French doors with clear glass to use for displaying china ware. With Cherry wood floors and a wall fully-tiled in 20×20 yellow stone tiles, this modern kitchen uniquely combines simple natural pine cabinets with white finished traditional style cupboard. 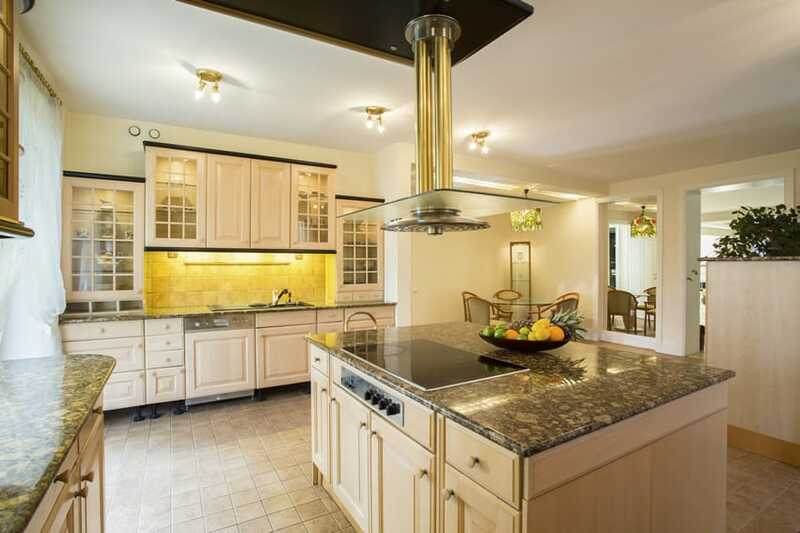 The pine cabinets is devoid of overhead cabinets as large windows and range hood occupies most of the wall. 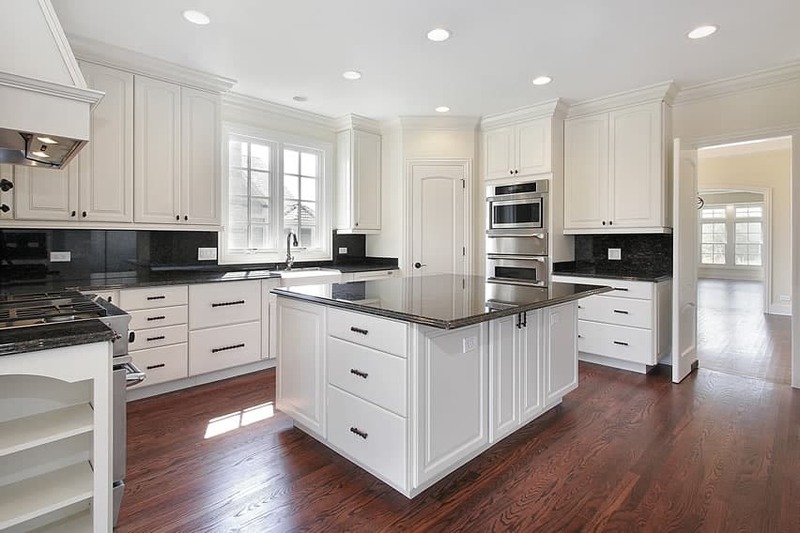 The white island counter matches the white cupboard but uses black granite countertop instead of white to match the countertop of the pine cabinets. The light Oak engineered wood floors and plain white walls contribute much to the brightness of this kitchen space. It has neo-classic inspired Cherry cabinets which divides the overhead cabinets into storage and display. It uses diagonally-arranged red stone tiles for the backsplash to match the cherry cabinets and uses black granite for the main counters and re granite for the island counter. 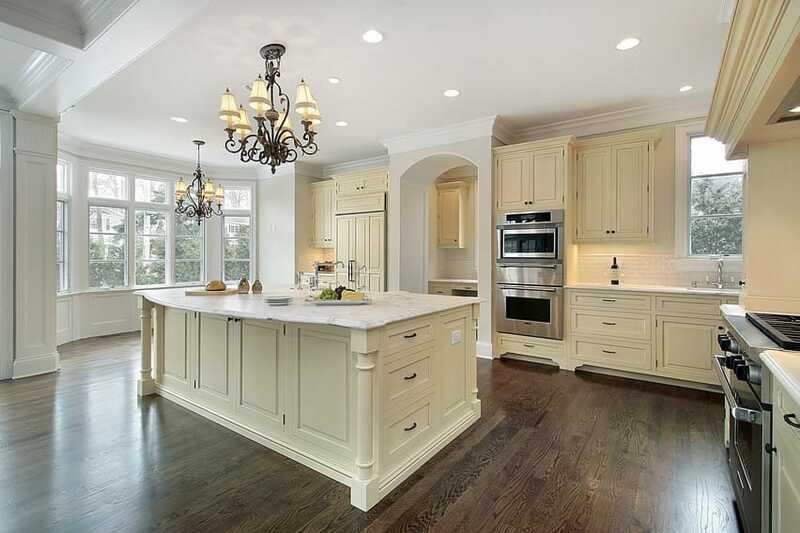 A very large kitchen that looks traditional not only because of its cabinets, but also for its architectural details. Gray and light yellow stone tiles gives a light and neutral flooring, making way for the heavy details of the Maple cabinets. The exposed wooden trusses and slats of the ceiling serves as an interesting architectural detail which gives the kitchen a more legitimate traditional appeal. In the middle of the kitchen stands the white island counter with light gray countertop to balance out the redness of the maple cabinets. 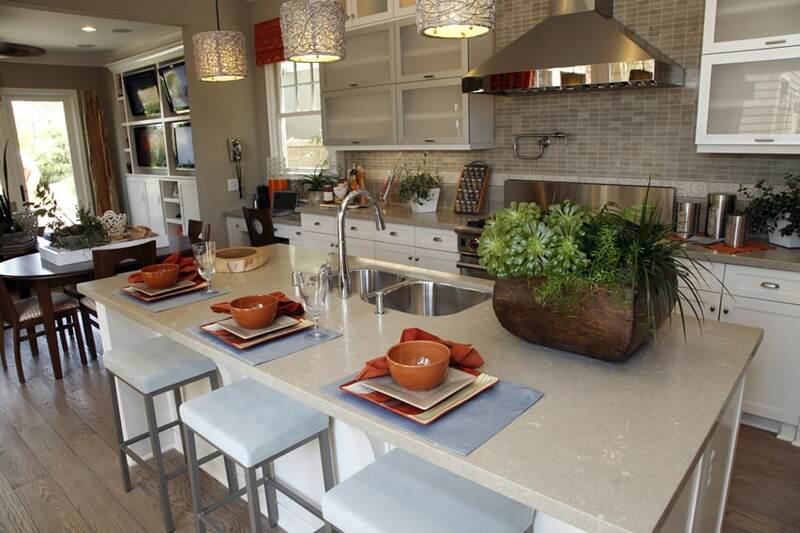 The gorgeous blue pearl granite counters are a sure stand-out in this simple kitchen. Floors uses off-white rectangular ceramic tiles in a running bond pattern combined with light tan walls and bleached wood cabinet doors which makes the gorgeous blue of the countertop stand-out more. A small L-shape kitchen with neo-classic design inspiration, using false columns and corbels as its design elements. The main kitchen cabinets are in a light cream color which matches the slate tiles of its backsplash wall. 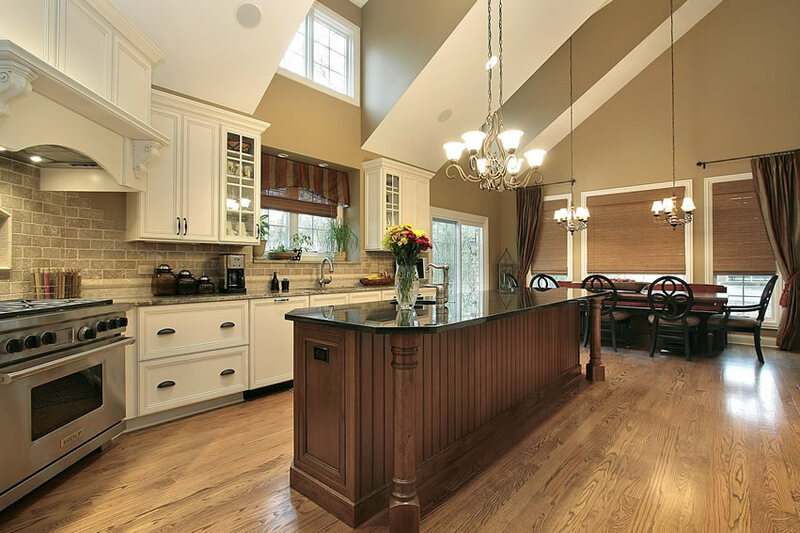 In contrast, the island counter is in Cherry wood finish, closely matching the tone of the Dark Walnut floors. All counters uses Black Granite with round nosing, with matching oil-rubbed fixtures. Luxury kitchen ideas that combine a traditional style kitchen with modern finishes and materials can achieve a transitional style for a clean look. For this luxury kitchen the flooring material used is engineered Oak floors in a diagonal layout. The main traditional cabinets are laminated in an off-white color with a semi-gloss texture to match the stone tile backsplash. Most of the appliances are concealed within the cabinetry to maintain a clean and uniform look, and the countertop material is Black Granite to contrast the white cabinets. On the other hand, the island counter is laminated in Dark Walnut and uses white marble counters for a more luxurious appeal.